A century or more in the future, Melanie Tarent is killed in a terrorist attack in Turkey by a frightening new weapon. The only trace the weapon leaves behind is a triangular scorch mark on the ground. Her husband, Tibor, returns home to Britain and learns that the same weapon has been deployed on a larger scale in London, leaving a hundred thousand people dead. There appears to be a connection to something in Tibor's past, something he has no memory of. The events in Tibor's life have ramifications across the years. During WWI a stage magician is sent to the Western Front to help make British reconnaissance aircraft invisible to the enemy and has a chance meeting with one of the most famous writers alive. During WWII a young RAF technician meets a female Polish pilot and learns of her desperate desire to return home and be reunited with her missing lover. And in the English countryside of the near future, a scientist creates the first adjacency, and transforms the world. Reviewing a Christopher Priest novel is like trying to take a photograph of a car speeding past you at 100mph without any warning. You are, at the very best, only going to capture an indistinct and vague image of what the object is. Photography, perspective and points of view play a major role in Priest's latest novel, as do some of his more familiar subjects: stage magic, WWII aircraft and the bizarre world of the Dream Archipelago. The Adjacent is a mix of the familiar and the strange, the real and the unreal, the lucid and the dreamlike. It's the novel as a puzzle, as so many of Priest's books are, except that Priest hasn't necessarily given you all the pieces to the same puzzle. The book unfolds in stages, draped on the skeleton of Tibor's adventures (for lack of a better term) in the Islamic Republic of Great Britain. The normal eye-rolling which accompanies any suggestion that Britain could ever become such is mediated here by knowing some of Priest's narrative tricks. This is a future, not the future, and it is possible that it may not be the future of our world but another where history has unfolded differently. From this linking narrative we move back to the First World War, forwards to the Second, sideways to one of the islands of the Dream Archipelago and, in the middle of it all, a short interlude in an English scientist's garden which may hold the key to the whole thing. The book's ending is revelatory, but only in the sense that you can now see the destination, not necessarily that you understand how you got there. As is also traditional with Priest's books, a full and richer understanding of the text will have to wait for re-reads. That said, Priest does play fair: by the end of the first read you should be starting to get a handle on what's going on. Of course, the novel's satisfaction as a puzzle and an impressive work of intellect would be nothing without Priest's formidable skills with prose, character, detail and atmosphere. His research is put to good use, with the historical settings of the First and Second World Wars evoked to good effect. The future world he paints is convincing as well as disturbing. His central characters - many of whom seem to be doubles or reflections of one another - are convincing and detailed, with their growing frustration as events become more bizarre and inexplicable well-depicted. It also helps that all of the puzzles and mysteries surround that simplest and most traditional of narratives: a love story. If The Adjacent has a weakness, it's that it's a novel that, whilst readable by itself, will especially reward those already familiar with Priest's work. In particular, the sideways trip to the Dream Archipelago will likely completely confuse those not familiar with it, but readers of The Dream Archipelago, The Affirmation and The Islanders will be able to nod sagely and think that they are 'in' on what Priest is doing (or at least they can kid themselves they are). The Adjacent feels like a culmination of the ideas and tropes Priest has been exploring since at least The Affirmation was published thirty years ago, and is thoroughly rewarding on that basis. Newcomers unversed in the 'Priest Effect' (a term coined by David Langford to describe Priest's way of writing) may find some of the ideas in the book more impenetrable. 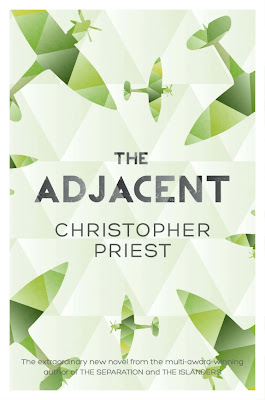 The Adjacent (*****) is puzzling, brilliant, frustrating, page-turning, disturbing and absorbing. It is traditional Priest. The novel will be published on 20 June in the UK and USA. This would be one of those books I would buy because of the cover. One of the few authors whoose work I buy on the day it comes out.. Islanders was brilliant, this sounds as good, if not better.